Skorzystaj z 40% zniżki i wygraj 1000 EUR na hotele! Promocja w ponad 1500 hotelach Accor w Europie obejmująca pobyty do 31 sierpnia 2015. W wybranych hotelach we Francji, Wielkiej Brytanii, Niemczech, Belgii, Holandii i Luksemburgu możemy skorzystać z 40-procentowej zniżki. Jest jeszcze podobna promocja obowiązująca w innych państwach (w tym w Polsce) - LINK DO TEJ PROMOCJI. Nie bierze ona jednak raczej w losowaniu poniżej opisanych nagród. Dodatkowo, mamy szansę wygrać aż 50.000 punktów Le Club Accorhotels, które warte są 1.000 EUR! W sumie takich nagród jest 336 i zostaną wylosowane wśród członków LCAH, którzy wezmą udział w powyższej promocji i odbędą nocleg w jednym z powyższych hoteli we Francji (300 nagród), Wielkiej Brytanii lub Irlandii (10 nagród), w krajach Beneluksu (20 nagród) czy w Niemczech (6 nagród). Tylko jedna osoba "z gospodarstwa domowego" (takie samo nazwisko i adres) może wziąć udział w promocji. Szczegółowe zasady losowania tutaj. This offer is only valid through Accorhotels.com between 30th June and 28th August 2015 for hotel stays between 4th July and 30th August 2015. There are specific conditions of sale for each brand and country participating in this special offer. Prepayment by credit card of the full cost of the stay charged at the time of the reservation. This payment cannot be refunded, even if the reservation is cancelled or changed. There are specific conditions of sale for each brand. This offer includes accommodation, a champagne cocktail served with amuse-bouches for two people on one occasion during the stay (depending on the hotel) and the option of late check-out (until 15:00). - The reduction is calculated on the basis of the Best Flexible Rate. - The qualifying room types depend on the hotel. - The offer is subject to conditions and restrictions on dates may apply. - The hotel’s policy concerning children is applicable. - For some destinations, the stated prices do not include local taxes, extras or gratuities (to be paid directly at the time of the stay) and may vary depending on the dates and the hotel’s general conditions of sale. - This offer does not apply for groups and cannot be combined with any other offer. - The total price of the stay is payable in advance by credit card at the time of the reservation. This payment cannot be refunded, even if the reservation is cancelled or changed. This offer includes the room, a buffet breakfast served in the hotel’s restaurant, and late check-out until 14:00. Prepayment by credit card of the cost of the stay at the time of the reservation is required. This payment cannot be refunded, even if the reservation is cancelled or changed. The package includes accommodation for a minimum of 2 consecutive nights, a buffet breakfast served in the restaurant, a voucher per person per stay for an immediate discount at the bar or in the hotel’s restaurant, as well as the option of a late check-out, subject to availability. The offer is valid in the listed participating hotels for a minimum stay of 2 consecutive nights. A 10% discount per night will be applied to the reference price list (Great Escape by Pullman). The offer cannot be combined with any other offers. The hotel’s policy concerning children is applicable. The stated prices do not include local taxes or supplements (to be paid directly at the time of the stay) and may vary depending on the dates and the hotel’s general conditions of sale. This offer does not apply for groups and cannot be combined with any other offer. No changes can be made to the reservation. This offer is valid for all stays of 1 to 3 nights between Friday and Sunday, reserved and used before 01 August 2015, in the participating aparthotels. No changes can be made to the reservation and it is subject to conditions and availability. Check the conditions of sale when making the reservation. This offer is valid subject to availability in the participating hotels for stays as of 4th July 2015. The full price of the stay must be paid in advance by credit card at the time of the reservation. This advance cannot be refunded, even if the reservation is cancelled or changed. This offer is subject to conditions and availability. This offer is valid for the participating ibis, ibis Styles and ibis budget hotels in France. The client agrees to the full payment of the price of the stay at the time of reservation, and that this payment is non-refundable in the event of the cancellation or any change in the dates of the stay. See list of participating hotels / Prices valid subject to availability and the number of rooms allocated for this offer, on the date of the stay and in the hotel chosen by the client, in the hotels participating in the promotion. Prices as of €24 per room and per night (breakfast not included). The offer is valid for all reservations made with the hotelF1 hotels taking part in the operation (see the list of participating hotels). The offer can be reserved up to D-1 before the date chosen by the client subject to the number of rooms allocated to the promotion by the hotel chosen by the client. The full price of the stay must be paid by credit card at the time of the reservation. This payment cannot be refunded, even if the reservation is cancelled or changed. The offer cannot be combined with any other current promotional offer and/or benefit. - The full price of the stay must be paid in advance by credit/debit card at the time of the reservation. This payment cannot be refunded, even if the reservation is cancelled or changed. This offer includes accommodation and breakfast, tea and a City Pass. Minimum stay of 2 nights. Refer to the conditions of sale of each hotel. The package includes accommodation for a minimum of 2 consecutive nights, buffet breakfast served in the restaurant, and guaranteed late check-out. The offer is valid in the listed participating hotels for a minimum stay of 2 consecutive nights. The client receives the equivalent of one night at half price for the 2 nights reserved. The invoice shows 2 nights, with the half-price night corresponding with a total discount of 25% off the valid reference price (Great Escape By Pullman) over 2 days at the time of the reservation. The offer cannot be combined with any other promotion. The stated prices do not include local taxes or supplements (to be paid directly at the time of the stay) and may vary depending on the dates and the hotel’s general conditions. This offer does not apply to groups and cannot be combined with any other offer. This payment cannot be refunded, even if the reservation is cancelled or changed. Prepayment of the full cost of the stay by credit card at the time of reservation is required. The hotel’s policy concerning children is applicable. Offer subject to availability at participating hotels. The cost of the stay must be paid in full by credit card at the time of the reservation. This advance cannot be refunded, even if the reservation is cancelled or changed. This offer entitles Le Club Accorhotels members, regardless of their status, to a bonus of 600 points for all reservations made at a participating hotel in the United Kingdom. The general conditions of sales of Le Club Accorhotels apply. This offer is valid in all participating Ibis, ibis Styles and ibis budget in the United Kingdom, for stays as of 17th July. This offer entitles Le Club Accorhotels members, regardless of their status, to a bonus of 300 points for all reservations made at participating Ibis and ibis Styles hotels in the United Kingdom. The general conditions of sales of Le Club Accorhotels apply. 1. The reservation must be made online (at accorhotels.com or our brand sites participating in Le Club Accorhotels program) or through our Accor Central Reservation Office. Reservations made by any other means are not eligible for this offer. 2. The loyalty card or the member’s number must be presented at the time of the reservation and also to the hotel reception when checking in. 3. 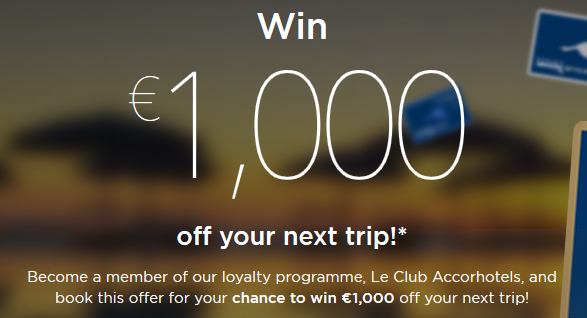 The Le Club Accorhotels bonus points will be added to the member’s account within 10 days following the date of the end of the stay at the hotel. 4. For this offer, a stay consists of one (1) reservation by a member of the Le Club Accorhotels loyalty program, regardless of how many rooms are covered by the reservation. A reservation made by a member covering several rooms will only count as one (1) stay. 5. The offer cannot be combined with any other special offer or benefit and is not valid for groups. 6. This offer is subject to conditions and availability. The conditions of sale for the specific price lists for each hotel apply. The 600 Le Club Accorhotels points at Mercure and Novotel are equal to €14, calculated on the basis of the exchange rate at the start of the offer. The 300 Le Club Accorhotels points at ibis and ibis Styles are equal to €7, calculated on the basis of the exchange rate at the start of the offer. The bonus point do not apply for reservations made in ibis budget hotels. See the conditions of sale of each hotel. - The total cost is payable in advance by credit card at the time of the reservation. This payment cannot be refunded, even if the reservation is cancelled or changed. This offer includes the room, a buffet breakfast served in the hotel’s restaurant, and late check-out until 14:00. Prepayment by credit card of the full amount of the stay is required at the time of the reservation. This payment cannot be refunded, even if the reservation is cancelled or changed. This offers includes accommodation and buffet breakfast for two people. – The reduction is calculated on the basis of the Best Flexible Rate. - The qualifying room types depend on the hotel. – The offer is subject to conditions and restrictions on dates may apply. - The hotel’s policy concerning children is applicable. – For some destinations, the stated prices do not include local taxes, extras or gratuities (to be paid directly at the time of the stay) and may vary depending on the dates and the hotel’s general conditions of sale. - This offer does not apply for groups and cannot be combined with any other offer. - The total cost is payable in advance by credit card at the time of the reservation. This payment cannot be refunded, even if the reservation is cancelled or changed. This offer is valid subject to availability at participating hotels. The full cost of the stay must be paid in advance by credit card at the time of reservation. This advance cannot be refunded, even if the reservation is cancelled or changed. The "Unforgettable Nights" offer is valid for stays as of 10th July 2015. The offer is valid in participating ibis, ibis Styles and ibis budget hotels. The “Unforgettable Nights” rate corresponds with the stated price including taxes at the time of the reservation and is valid for one room (subject to the authorised number of persons per room). For ibis Styles hotels, the price includes self-service breakfast and unlimited Wi-Fi. The reservations must be made in advance online, through the call centers or directly with the hotel. The offer is valid subject to availability and the number of available rooms allocated to this offer on the date of the stay and in the hotel chosen by the client. The offer can be used several times during its period of validity. It cannot be combined with other existing offers or benefits. The cost of the stay must be paid in full at the time of the reservation. This payment is non-refundable, even if the reservation is cancelled or changed. The reduction for breakfast is only available if this is reserved at the same time as the room. No reduction for breakfast can be applied once the room reservation has been confirmed. The package includes accommodation for a minimum of 2 consecutive nights, a buffet breakfast served in the restaurant, a voucher per person per stay for an immediate discount at the bar or in the hotel’s restaurant, as well as the option of a late check-out, subject to availability. The offer is valid in the participating hotels listed for a minimum stay of 2 consecutive nights. A 10% discount per night will be applied to the reference price list (Great Escape by Pullman). The offer cannot be combined with any other offers. The hotel’s policy concerning children is applicable. The stated prices do not include local taxes or supplements (to be paid directly at the time of the stay) and may vary depending on the dates and the hotel’s general conditions of sale. This offer does not apply for groups and cannot be combined with any other offer. No changes can be made to the reservation, even if the reservation is cancelled or changed. This offer is valid for all stays of 1 to 3 nights between Friday and Sunday, reserved and used before 1st August 2015, in participating aparthotels. No changes can be made to the reservation and it is subject to conditions and availability. Check the conditions of sale when making the reservation. This offer is valid subject to availability in participating hotels for stays as of 4th July 2015. The full cost of the stay must be paid in advance by credit card at the time of the reservation. This advance cannot be refunded, even if the reservation is cancelled or changed. This offer is valid for stays in Belgium, Luxembourg and the Netherlands in a selection of participating ibis, ibis Styles and ibis budget hotels. The price corresponds with the stated price including taxes at the time of the reservation and is valid for one room (subject to the authorised number of persons per room). For ibis Styles hotels, the price includes self-service breakfast and unlimited Wi-Fi. The reservations must be made in advance online, through the call centers or directly with the hotel. The offer is valid subject to availability and the number of available rooms allocated to this offer on the date of the stay and in the hotel chosen by the client. The offer can be used several times during its period of validity. It cannot be combined with other existing offer or benefit.